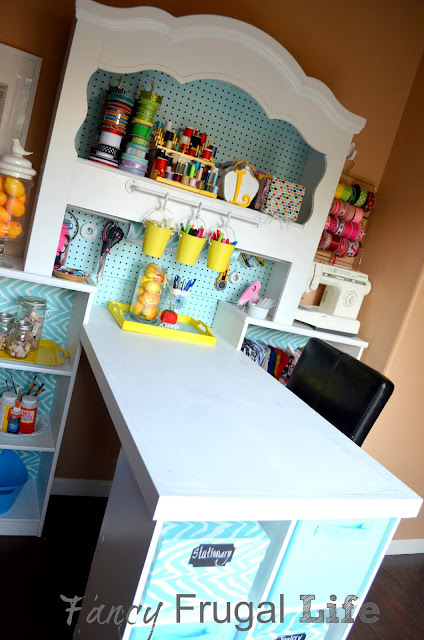 Yesterday I stenciled my craft nook desktop. Take the tour here in case you haven't yet. Cutting Edge Stencils was so generous to send me a nice big stencil to try! I loved it. 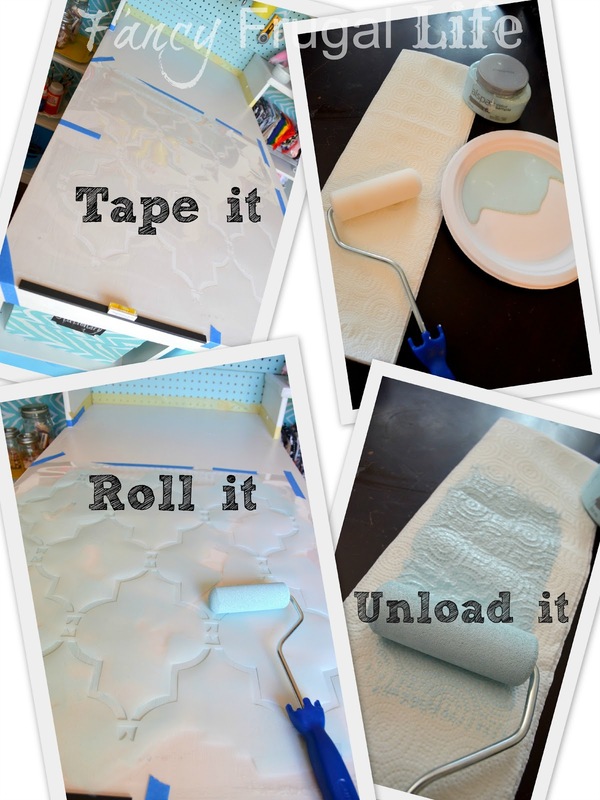 Their stencils are reusable, interlocking, and incredibly easy to clean. The paint just wipes off easily with water! The first thing I did was watch their how to video. Cutting Edge Stencils has a beautiful blog with lots of Stencil tips, videos, and customer ideas. They also sent me a little level that slides on to the bottom of the stencil (shown below). I picked the Moroccan Dream All Over Stencil, and used more of the Crystal Blue satin paint from Valspar. 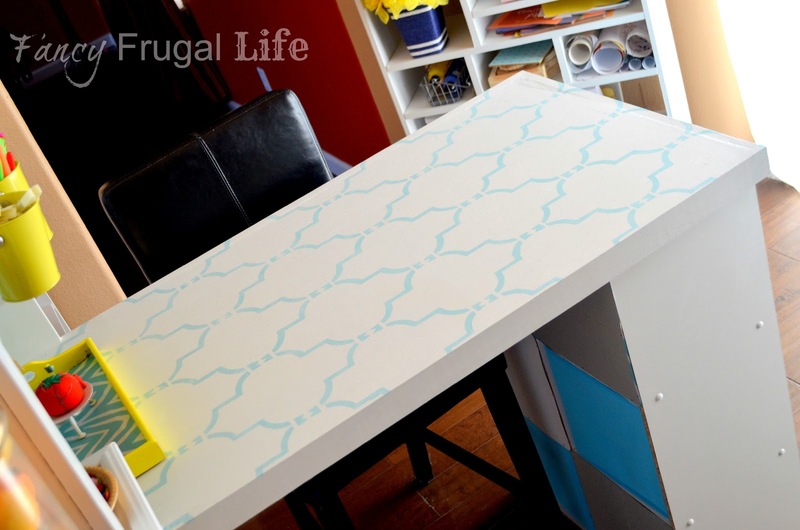 The first thing I did was tape my stencil to the desk with painters tape. I used their stencil roller and made sure to unload on the paper towel before rolling on the stencil. It was pretty easy to do and was easy to find my place to paint the next row. My stencil came with a few mini ones to fit in corners and sides. Now here's YOUR opportunity to win a stencil!! Yay!! This is such a great giveaway! Trust me you will LOVE. 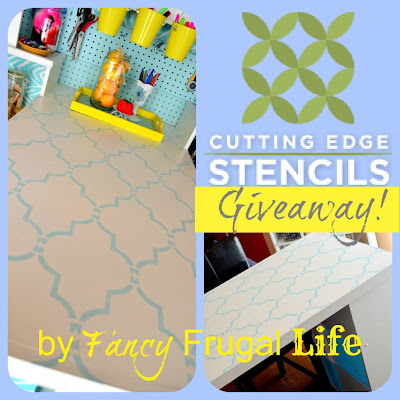 The winner will get to chose any stencil up to a $50 value! ***Like Cutting Edge Stencils on Facebook and comment here that you did/ or already do. So you can have three separate entries to win! The Connection Allover stencil is crisp and the right amount of square. It's very pretty. I love all their stencils, but I'd have to choose Zagora All Over Stencil. I like the Casablanca and the Alessa Scroll. I also "Liked" on FB! Oh my - so many choices. My favorites are the large pear tree and the large tree and birds, the tiger, all the craft size and all the holiday patterns. i love the Marrakesh stencil! Thanks for the giveaway! Hi there! I love your blog, I'm also now following you on twitter. I would probably choose the Casablanca stencil. Or the Zagora, or the Moroccan Dream...oh it is so hard to choose one. I'm back to enter your give-a-way. I visited Cutting Edge Stencil and gosh it's hard to narrow down. Love so many of them. I really like the "Bird on a Branch" wall stencil, really I like all the bird and tree ones. Back again~I already do "LIKE" Cutting Edge on Facebook. 3d times a charm right~so I'm back to let you know that I just "Followed" you on Twitter. I can't wait to do the scallop in my front entry!! I don't us twitter, but I've been following cutting edge stencils on FB for a while now, they're great!! I loved the "going to seed wall stencil" so cute for any corner or even a child's room. I would choose the allover stencil-Oasis-. I think that would look good in our bathroom. Thanks! i would choose the zagora stencil. it would be so cute in the baby's nursery. I would choose the harlequin Trellis stencil. I can totally see that in my living room!